This is actually nothing new in Singapore. There have been many discussions on blog aggregators and various online forums on the subject of people taking photographs of unsuspecting or unwilling victims using mobile phone cameras. Interestingly (or surprisingly) enough, it is quite common to see comments supporting the photographers, even when the offensive picture has been taken from behind and underneath a woman wearing a skirt on an escalator. Many people do not seem to take offence, or in fact see anything wrong with this behaviour. This to me is bewildering. It is, without a doubt, an extreme invsion of privacy. I should also add that the promotion of snaps taken by 'detective photographers' (commonly of commuters on public transport), on sites such as the Straits Times Stomp forum, does nothing to dissuade this errant behaviour. In the latest case to make news this week, most of the 'offensive' pictures were of ladies' breasts while fully clothed, and although the women were completely unaware that a pervert was taking pictures of them, it has to still lead to most of the comments and discussions online suggesting that there is absolutely nothing wrong with what this person has done. In most other countries and situations, this behaviour is totally unacceptable and punishable by law. The man in question was caught with more than 500 offensive photos in his mobile phone. A woman filed a complaint against him, after he took a picture of her chest at a shopping centre. The woman, known simpy as Ms Ye, noticed the man while she was at Vivo City with her husband two months ago. 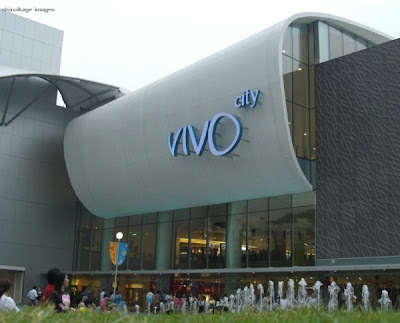 Said Ms Ye, "I was at Vivo City with my husband to catch a movie when we caught man taking a photo of my chest. My husband managed to catch him before he could escape, but the culprit had already deleted all the pictures in his mobile phone. I was worried that all evidence might have been wiped out." 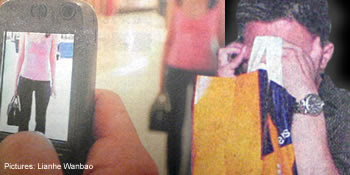 The police did not immediately arrest the man, but did in fact confiscate his mobile phone. They were subsequently able to restore the deleted photos. Ms Ye then attended the Clementi police station, where she assisted in their investigations, only to discover that the man who took her photo also had 500 other offensive pictures of women's breasts in his mobile phone. Ms Ye went on to say, "The police needed me to assist in identifying any photos of myslef that the man might have in his phone. My husband and I were shocked when we were shown the data because there were more than 500 pictures of various women that this man took. All the pictures were of their chests and breasts. From the angle of the shots, I could see that the women in these pictures were not aware that they were victims." On the subject of her own picture, "The picture he took was very clear, he even managed to capture my face in profile." Police have identified the suspect, but have not yet made any arrests or laid any charges. Investigations are continuing. Under Singapore law, anyone who takes offensive photos of a woman in a public place without the lady's prior consent can be charged for outrage of modesty. The suspect faces a fine, or up to a year in jail (or both) if found guilty. That is sick and some time of legislature should be put into place to stop it.